What’s been happening at Small Bites by Jessica, plus this week’s Menu Plan Monday, and links I loved over the past week. Last week I shared with you a bunch of posts to help with back-to-school planning, especially when it comes to meals. Well, this week I have even more for you, including my latest back-to-school post 5 Quick, Easy, & Healthy School Lunch Ideas + 36 Recipes to Try. And later this week we’ll be sharing a roundup of breakfasts that will help you get the kids out the door on time! In other news, did you see my August Recipe ReDux post? Be transported to Italy with this recipe for Farinata, an Italian chickpea flour flatbread that I topped with in-season tomatoes, mozzarella and some basil pesto. Be sure to check out the entire post because there are close to 100 recipes from other RDs and healthy bloggers included! 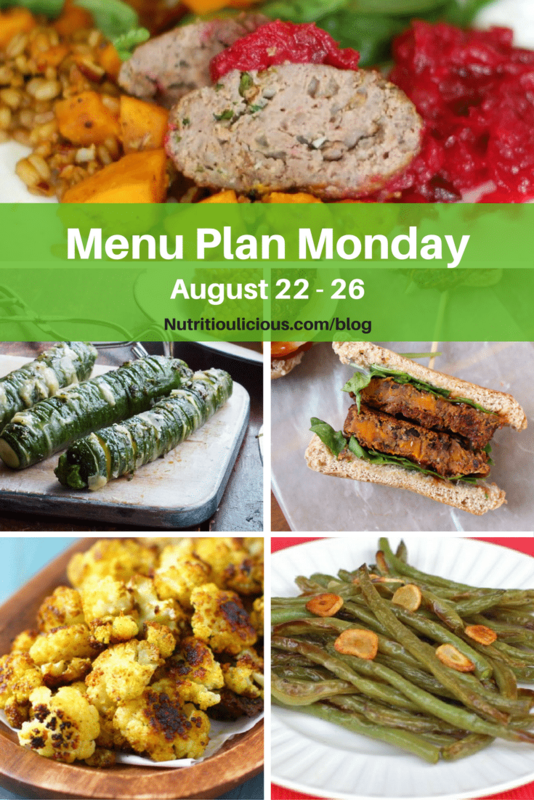 Now for this week’s link love and menu plan! ⇒ Love this basic guide for packing a healthy lunchbox, whether for the kids or yourself! ⇒ People are less fearful of fat these days than in the 80s and 90s, but I know many parents who still cut fat out of their kids’ diets (and their own). Lindsay explains why kids need fat and shares some great sources to give your kids. ⇒ You know how I feel about menu planning! In addition to my tips I shared recently at Real Mom Nutrition, here are a handful more for you. ⇒ Even more great tips for meal planning, saving time in the kitchen, and just getting in the kitchen to cook. Plus, delicious easy home cooked recipes to try! ⇒ If you think the goal of intuitive eating is weight loss, think again. That’s why intuitive eating will always work. Rachael explains. ⇒ Actionable ways to stop cravings and eat better when they hit. ⇒ I don’t know about you, but I rely on my phone way too much, and studies show it’s not good for kids to see their parents on their phones so often. Some important lessons in this post. ⇒ You can never go wrong with a peanut butter and chocolate combo! Can’t wait to make this to top yogurt or snack on its own! ⇒ Love salmon and the combo with strawberries sounds great! Great tip from Sonali about doubling the skewers! ⇒ Whether or not you need dairy-free meals, these are all great ideas. I especially love the focus on cuisines from around the world – it’s great to expose kids to different herbs and spices. ⇒ This is such a fun dessert recipe! ⇒ These tacos look so delicious. Perfect for #TacoTuesday (or any day of the week for that matter!). Can’t wait to include them in my next Menu Plan Monday! Looks like one delicious week! I’m coming for dinner tonight, Cauliflower rice and tofu sounds delicious, what time? Thank you for including a link to one of my recipes, it’s a favorite this summer! Thanks Sarah! Haha…I’d love to have you! I’m hoping to get that recipe up soon – haven’t been able to photograph it yet! I always love your menu plans Jessica (so much inspiration!) and appreciate the inclusion this week! Thanks Chelsey! Excited to make them tonight! Thanks Jessica! Your farinata looks amazing! Enjoy that hasselback zucchini tonight…YUM! Thanks Sonali! The hasselback zucchini was such a hit with the girls! I actually couldn’t believe it since they’re normally not interested in zucchini. Amazing what a little cheese can do! You have so many great recipes, I can’t help it! I love the idea of that PB Granola from Jamie- I don’t know how I missed that! As always, you are a rockstar mama- I need to plan better, every week I say that lol!